I hate cooking, like hate, hate it. But because I’m cheap and don’t want my 1-year-old son eating a bunch of fake food, cooking has become a necessary evil. Still, I avoid the stove at all costs. The crock pot is my saving grace. She — because all things magical and wonderful come from women — helps me knock out dinner for my whole family with only a few minutes of prep time. And even though only the tiniest Floyd in my household is a vegetarian, I can still make meals that work double duty to satisfy the adults and the little one. This is so easy, it barely counts as a recipe. Stock up on brown rice, organic, plain whole fat yogurt, fresh pico de gallo from your favorite grocer’s deli section and a few cans of organic black beans. Just warm some of the black beans in the microwave, scoop a few spoonfuls in a bowl, and toss in as many of the other ingredients as you want. Voila! 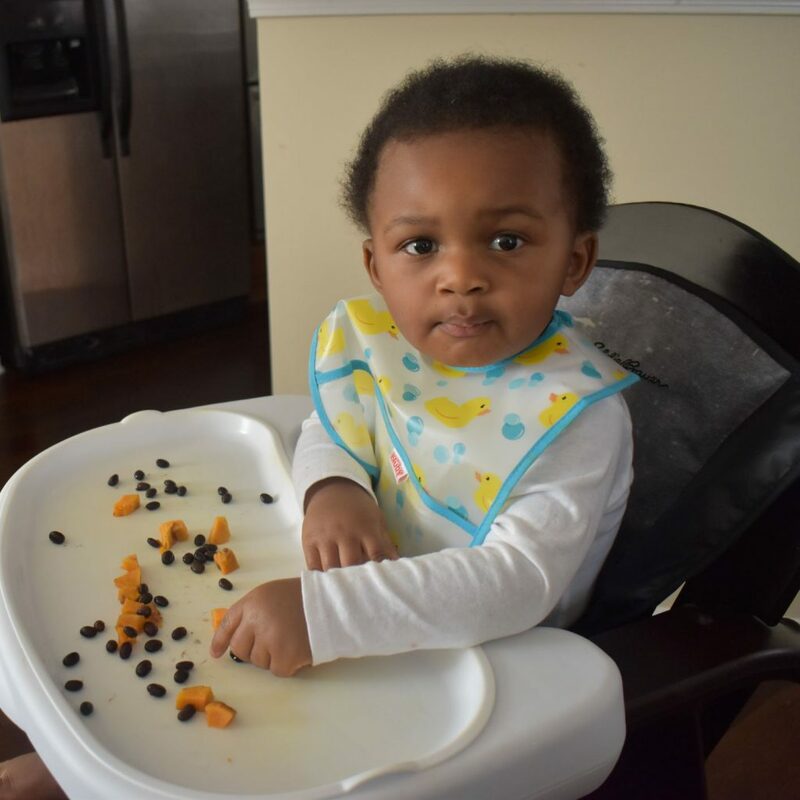 You have a 10-minute meal that you can either spoon feed your toddler or dump on the tray of his high chair to let him feed himself. This Olive Garden dupe is one I adapted from the website My Recipes. It takes about 30 minutes of prep time and four hours in the crock pot on high, but it’s a meal that works for vegetarians and meat eaters. You just have to scoop around the meat. You’ll need 1 pound of ground Italian sausage (or ground turkey), 5 russet potatoes peeled and cut in cubes, 1 chopped onion, 32 ounces of organic chicken broth, 2 tablespoons of garlic, 1 bunch of kale (chopped), 1 cup of heavy whipping cream, a few dashes of black and cayenne pepper and 2 tablespoons of whole wheat flour. Brown the sausage in a pan, and break it apart in medium clumps. That way the meat is easier to avoid later when you’re serving your toddler the soup. Next, throw the sausage in the crock pot with all ingredients except the kale, whipping cream and flour. Cook the soup on high for about 3.5 hours. Then, mix the flour in slowly. Add the cream, and stir in the chopped kale. Cook the soup for 30 more minutes, and it’s done. It sounds like a lot, but it’s worth every step. Otherwise known as fancy spaghetti, this dish barely needs a recipe. Just throw a bunch of veggies in the crockpot, and cook them for about 3.5 hours. You’ll need a few dashes of kosher salt and pepper, 1 bell pepper, 3 small zucchinis, 3 yellow squashes, ¼ cup of extra virgin olive oil, 1 28-ounce can of crushed tomatoes, a spoonful of minced garlic, ½ cup of fresh parsley, 1 teaspoon of dried basil and ½ teaspoon of dried thyme. I add a pound of ground turkey for the meat eaters, and scoop around it for my son. It doesn’t get simpler than this. All you need are blue corn chips, your favorite deli cheese, black beans, pico de gallo and avocado. Cut and mash up those avocados, and mix in the pico and black beans for guacamole. Then, break a slice of cheese into small pieces to melt on the chips. Scoop the guacamole on the cheesy chips, and get ready to watch your toddler demolish it. You may want to skip the chip altogether if your little one hasn’t mastered the chewing thing yet. I adapted this recipe from the blog a Pinch of Yum. You’ll need 1 cup uncooked wild rice, 1 pound of asparagus chopped, 1 container of sliced mushrooms, 1 chopped white onion, 1 cup of chopped celery and carrots, 6 cups of organic chicken broth, 1 teaspoon of Morton Nature’s seasoning, a 1/2 a cup of butter, 3/4 a cup of whole wheat flour and 2 cups of organic whole milk. Add everything in the crock pot but the butter, flour, milk, mushrooms and asparagus. Cook on high for about three hours. Then, melt the butter in a separate pan. Add the flour to the pan and slowly whisk in the milk until the mixture is creamy. Add more milk if necessary. Then, add the milky mixture, the mushrooms and asparagus to the crock pot to cook until the veggies and rice are firm (for about 30 more minutes). This is a meal I do to switch things up for my toddler when we’ve all had enough of the crock pot. I cut fresh sweet potatoes into cubes and bake them in a pan lined with aluminum foil and a light layer of extra virgin olive oil. I check them every 15 minutes or so until they’re the consistency I like. I boil about half a bag of lima beans stove top and stir the beans every few minutes. Then, I slice the cabbage into inch-long pieces. I boil them with a chopped onion in 2 cups of organic chicken broth. I add a few dashes of kosher salt and pepper, and we’re good to go. I adapted this recipe from Family Fresh Meals. You’ll need 1 yellow onion, 2 cups of chopped carrots, 1 pound of chopped asparagus, 1 container of mushrooms, 3 stalks of chopped celery, ½ teaspoon of dried thyme, 1/2 teaspoon of kosher salt, 1/4 teaspoon of pepper, 2 spoonfuls of minced garlic, 3 tablespoons of chopped parsley, 3 tablespoons of extra virgin olive oil, 1 bay leaf, 2 cups of uncooked whole grain egg noodles, 6 cups of organic chicken broth and 1 cup of water. Cook everything but the egg noodles, mushrooms and asparagus in the crock pot for about three hours. Add the mushrooms and asparagus, and let them cook about 20 minutes. Then, add the egg noodles to let them cook about 10 minutes. Zuppa Toscana is my all time favorite . I will definitely try this in my crock pot ! I love this post! I started my vegetarian journey one month ago and I too can use these ideas. These are great. 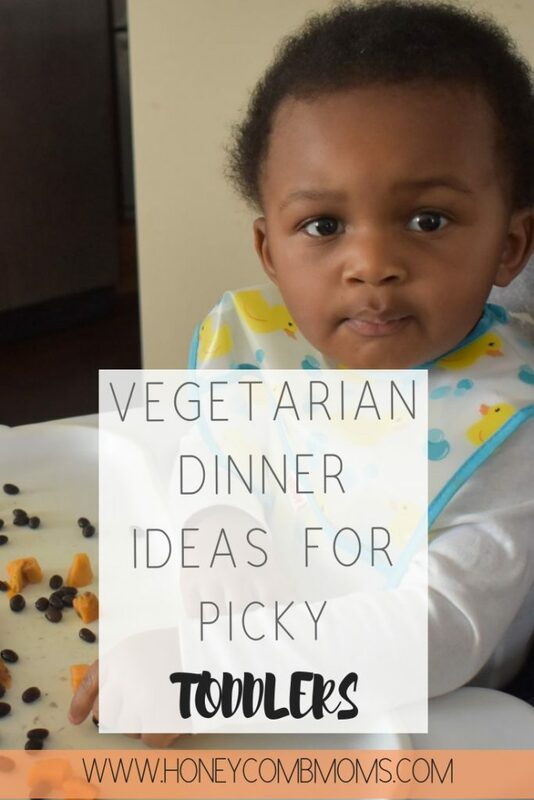 We’re not vegan but always look for ways to get little ones to eat more veggies. I admire your consistency and dedication to cooking. I cook because I have to but I don’t enjoy it. If I could just meal prep better it wouldn’t be so bad. What a cutie pie who is very much into eating veggies. Loving each of these recipes! My daughters have been vegetarians their entire lives and they enjoy their food as long as it is well seasoned.